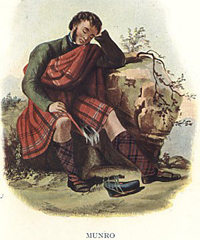 The origins of Clan Munro are lost in the distant past. By tradition, the early clan was made up of 11th Century mercenary soldiers from Ireland, they were granted lands in Ross by a grateful King after assisting him in defeating the Viking invaders of this part of Scotland.From documentary evidence they were well established by the middle of the 14th Century on the north shore of the Cromarty Firth in the area known as Ferindonald (Donald's land) named after their legendary first chief. From this narrow base comprising the modern parishes of Kiltearn and Alness they gradually spread their sphere of influence northwards and eastwards into the fertile plain of Easter Ross. They initially held land as vassals of the powerful Earls of Ross. On the forfeiture of that earldom they were loyal directly to the Crown. Their lands later became the Barony of Foulis (pronounced "fowls") and thereafter the chief and his family were esignated "of Foulis". The clan spread into Sutherland and were also given a charter for lands in Strathspey in 1309. The chiefs were Bailies to the Macdonalds, Earls of Ross and Lords of the Isles. Robert of Foulis supported Robert the Bruce at Bannockburn in 1314. Robert Mor, 15th chief, was a staunch supporter of Mary Queen of Scots and he received many favors from her son, James VI. During the 17th century, the Munros fought in the continental wars and Robert, the 18th chief, joined the army of Gustavus Adolphus. He raised 700 of his own clan for service in Sweden and Denmark in defense of Protestantism. He greatly distinguished himself and his Scots received the name the "Invincibles". A law abiding and peaceful clan in general, nevertheless when needs arose they stoutly defended their interests against more powerful neighbors. Loyal to the Crown early in the reformation, the Chief and his followers adopted the Protestant faith. This move greatly influenced future clan policy. It was a Munro of Foulis who was one of the original commanders of the six independant companies when they were raised in 1725. In 1740 when the companies of the "Black Watch" were formed into the 43rd (and later 42nd) Regiment, Sir Robert Munro, 6th Bart, was appointed Lieutenant Colonel. Sir Robert also published an account of his fortunes with the MacKay regiment in the Thirty Years War. The clan later supported the Protestant succession to the British Crown against the Catholic Stuarts during the Jacobite Risings of the 18th Century. This tradition of distinction in military service was to continue throughout the 19th and 20th centuries. The Munro clan made their mark in other fields. They made a significant early contribution to Scottish traditional arts in the fifteenth century with what is probably the earliest piece of pipe music written for the Pibroch. One piece, entitled 'Bealach na Broige', has been attributed to one of the early Munro family. The Munros also became known for their prominence in the Scottish clergy. The most notable Munro clergyman was the Rev. Alexander Munro whose parish was at Cape Wrath on the very northwest tip of Scotland. He was not alone in the family in his choice of profession as the Munros boasted two other ministers enrolled as Justices of the Peace in Sutherland and two in Caithness. The most prestigious position attained by a Munro in politics was achieved when James Monroe became President of the United States of America in the nineteenth century. 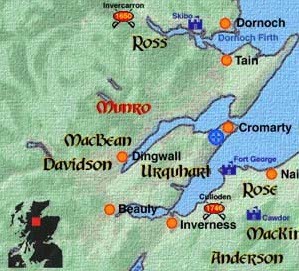 The lands of Clan Munro lie on the north side of the Cromarty Firth on the northeast coast of Scotland. Known as Ferindonald from the gaelic 'Fearainn Domhnuill' (Donald's Land), this is likely a reference to Donald Munro who returned the clan from Ireland.The current chief, Hector Munro of Foulis, has the family seat of Foulis Castle in Ross-shire.. 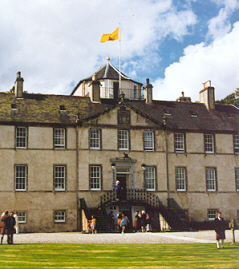 The current chief, Hector Munro of Foulis, has the family seat of Foulis Castle in Ross-shire.. Applicants must bear the name Munro by birth or descent in one of its various spellings (Munro, Monro, Munroe, Monroe, etc.) or of the Septs (Foulis, Dingwall, Vass, MacCulloch or MacLullich) by birth or descent, or be in sympathy with the objects of the Association.